I've launched my session but participation is low. How can I encourage my team to log in and participate? Send a note introducing POPin, setting expectations, and encouraging multiple POPin visits. Incentives for strong participation metrics can also provide value. Send out reminders via email using the Share Link to help keep the POPin top of mind - include phrasing such as “time is running out” or “last chance to participate” in your subject line and mention the top one or two answers in the email text to get them curious and interested in the conversation. My POPin has already ended but I didn't have any activity. How can I extend my POPin? Click on the POPin tab next to your results and select 'Extend' from the menu. 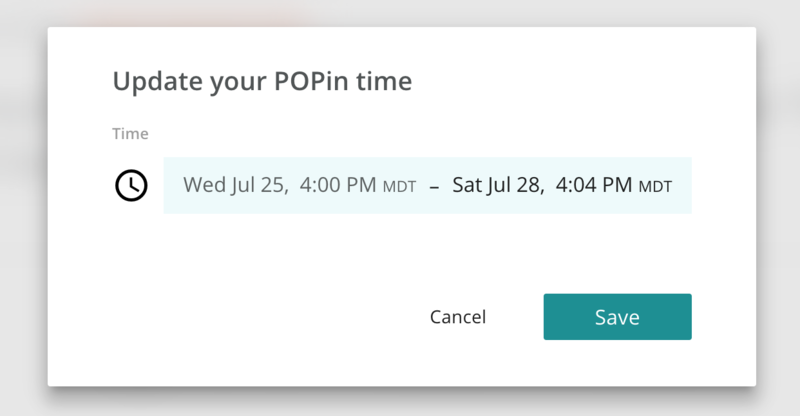 Select the new time you'd like your POPin to close, and hit 'Save'. After extending your POPin, use the tips above to drive participation from your audience.